With the launch of iOS 12 post WWDC 2018, by Apple, users are armed with the /pilliant features of this OS on their iPhone and iPads. Be it using FaceTime with multiple users, faster and better device performance, quick app launch, typing with keyboard or more responsiveness, iOS 12 has aced it all. You can even create a Memoji and monitor Screen Time. Though, the benefits are aplenty, the major issue experienced so far is data loss due to iOS 12 upgrade. If you are in such a situation, then how will you save your data? Especially, do you know how to recover deleted WhatsApp messages in the first place? Well! You don't have to worry about that at all. Through this article, we are going to show you different methods for retrieving deleted WhatsApp messages. 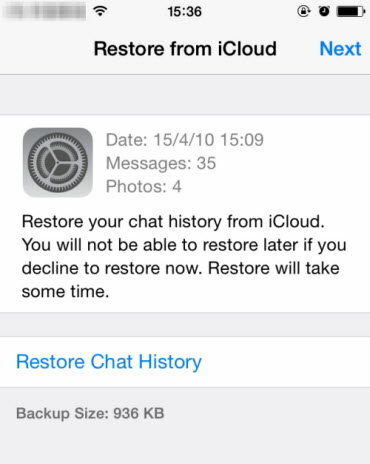 If how to recover deleted WhatsApp messages on iPhone is what bothering you right now, keep calm! Tenorshare UltData is here to sort the blues and /ping peace. This tool can fix almost 50 iOS issues including data loss due to iOS 12 upgrade as well. Whether your iPhone screen /poke down, stuck on Apple Logo or it was factory reset, UltData will effectively resolve all iOS issues. Even if you don't have a backup, you can recover your WhatsApp messages along with other data in 3 methods – from the iOS device, from iTunes backup, and iCloud backup. Around 25 data types are supported by this application. Step 1: Get Tenorshare UltData installed on your computer depending on the system OS. Launch the software and then connect your iPhone/iPad to it using a lightning cable. Ensure that the device is turned on and then select 'Recover from iOS Device' from the software interface. Step 2: From the next interface, you need to select the desired data type to begin scanning. Here you can select all or 'WhatsApp & Attachments' in this case. Tap 'Start Scan' right after selecting the data to be scanned. Step 3: Once scanning gets over, you can see all the scanned files segregated categorically. Pick 'WhatsApp Messages' from the left panel and selectively recover post preview. You can also print the desired photos by selecting the printer directly from here. Step 4: You can set the 'Output Settings' and select the destination folder on your PC as well to retrieve deleted WhatsApp messages. Also, choose whether you wish to recover on your PC or device. Step 1: From the UltData interface, select 'Recover from iTunes Backup File' soon after launching the program and connecting your iPhone to the computer. Choose the desired backup file from the displayed list and tap 'Start Scan' button. Step 2: Now, you will see the data scanned and arranged categorically. Tap on 'WhatsApp Messages' under 'App Data Recovery' and then select 'Show Only Deleted' from the drop down list on top. Preview the data and then select the desired messages you want to recover. Step 3: Hit the 'Recover' button to recover the selected data or individual WhatsApp messages. You can select even 'Recover to Device' to directly recover the deleted data to it. This is how to restore deleted WhatsApp messages without backup, means when you have lost the iTunes backup. Step 1: Launch the software and connect your iPhone using a lightning cable. Click the 'Recover from iCloud Backup File' tab on the UltData interface. Step 2: After being navigated to the iCloud login page, within UltData, key in your iCloud account details. Choose the preferred iCloud backup file and hit the 'Next' button. Step 3: On this page, select 'WhatsApp & Attachments' under 'Memos & Others' section and tap the 'Next' button. Wait until the backup gets downloaded. Step 4: Now, you can preview the deleted data by selecting the 'WhatsApp Messages' option under 'App Data Recovery' and then select 'Show Only Deleted'. From the preview, select the specific WhatsApp messages and then click 'Recover'. Step 5: Assign a file type and destination location and tap the 'Save' button. You can also select 'Recover to Device' instead of 'Recover to Computer' afterwards, if you want to recover deleted WhatsApp messages, contacts and notes directly from here. From the above article, we reached into conclusion that Tenorshare UltData has the best solutions for resolving how to restore deleted WhatsApp messages without backup. Choosing either of the methods to recover deleted WhatsApp messages, the result will be par excellence. Hope you like this post and will surely try this method to recovery your messages.